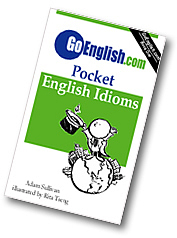 Today's Idiom = "At This Juncture"
At this juncture means at this time (now) based on the things that are happening (now). Example: "Are you going to buy the ABC company?" Reply: "No. Not at this juncture." "Not at this juncture" means not now, not yet, not based on what is happening now. Example: "I am so glad to have finished school." Reply: "At this juncture, you should get a job." "Not at this juncture" means that it will not happen now, but it could happen in the future. Example: "We may get married someday, but not now. Not at this juncture."